And so the hunt for the 39 clues continues, culminating in another revelation at the end of this book with enough unanswered questions to leave the reader anxious to read the next book. For the first time, 11 year-old Dan Cahill gets separated from his 14 year-old sister Amy Cahill and their au pair Nellie Gomez in China, a country with a population of over one billion people. Dan inadvertently joins Jonah Wizard and we learn more about this character, the Janus branch, and his role in the search for the 39 clues. I love the relationship between Dan and his sister. We get to see how it is tested once again at this point in the story and how much they care for one another. Two scenes in this book reveal their characters when faced with choices to beat their opponents. The historical figures that lead us to the next clue are Puyi, China’s last emperor, and George Mallory. I really enjoyed the setting of this book, and although the last nail-biting scene was a little far-fetched, it’s what marks The 39 Clues as an adventurous roller-coaster ride filled with interesting historical and scientific tidbits. Unlike the other books, this one also contains a message within the book that is conveyed by putting together the 17 words circled throughout the book. They form three sentences. Two more books left in this series and I am eager to find out how it will all come to a finish. 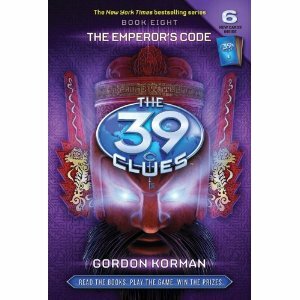 For fans of The 39 Clues this book will not disappoint. It builds up expectation for what will come next … and for the climactic ending, no doubt. Eight books! All of which I have enjoyed. Not familiar with The 39 Clues? Then listen in as Peter Lerangis, author of Books 3 and 7, answers 5 questions about The 39 Clues. These books are the perfect gift for either boys or girls interested in action adventure and who may be reluctant readers. Historical figures are highlighted throughout the books so kids will learn some history as they embark on a roller coaster fun adventure. 7. Giveaway ends July 16, 2010. I am so sad this is an Canada only giveaway. My kids are just getting into this series. We are reading book one together and I have a feeling this will be something that will be read again. Good luck to everyone and thanks for sharing info about the series. No need to enter me in the giveaway, but this sounds like a great series for parents to read with their children! Hi Laura please count me in on this giveaway please. I actually got to meet Nikole when she was in town last year and she is super sweet. I'm not a Canadian resident, but I wanted you to know that we posted about your giveaway at Winning Readings. Thanks for posting this, Megan! I am a Canucker, and a new follower. It would be awesome to win this super giveaway. These are new to me. Would love to win them. Please add me to the giveaway. Thanks. Would be good to read about their brother sister relationship that gets tested. I love that historical figures are introduced to kids in these books. And they're introduced in a way that isn't boring, but exciting!